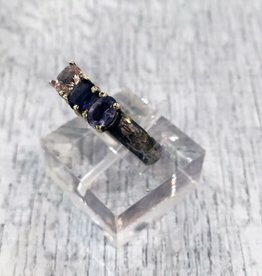 Stunning, unique, feminine lilac and plum Iolite and radiant pink Cubic Zerconia in solid white gold settings. The band is textured, oxodized solid sterling silver. Such a lovely contrast with the gems! We only use nickle free white gold!